Chibu-mura is the furthest of the Dozen islands, and the least inhabited. It takes over twenty minutes to reach Chibu-mura by ferry from the other inhabited Dozen islands. Chibu-mura consists of the main island of Chiburijima, with a population of less than 600 people, as well as the four uninhabited islands of Okagashima, Shimazujima, Asashima and Kamishima. After walking 10 K in Nakanoshima, I would be completing 13 K on Chiburijima to concluded my first day of the 3-Day walk across Oki. I embraced Chibu with a sense of wonder. This is one of the most remote and sparely inhabited places in Japan. I felt exhilaration at　the chance to see and experience a place so few other had experienced. When the coast of Chibu-mura came into view, huge concrete sculptures emerged from the water around the coastline, with staircases leading to the sky. I felt as though I had entered a Dali painting. These structures are not decorative, they break the sea’s rough waves as they come crashing to the shore. The port of Chibu-mura is what one would expect from an island of 600 people: a small, empty room with a few posters and T-shirts. 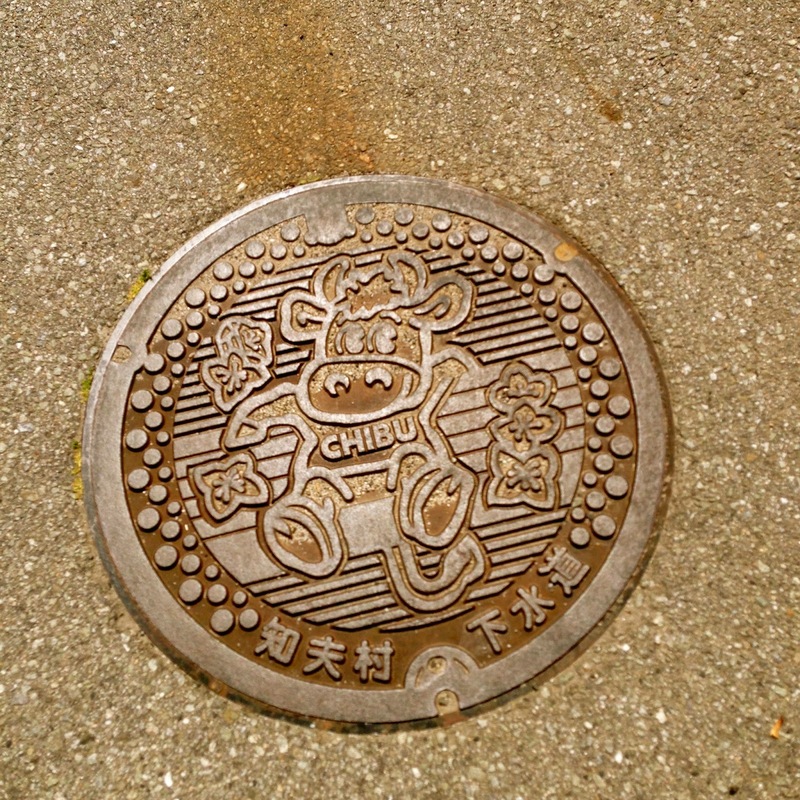 To me, Chibu-mura is an interesting eample of rural Japan. Unlike small villages on the mainland, which were once booming towns before mass migration drew hoards of people out of the countryside and into the citie, Chibu-mura has – since the dawn of time– been a sparsely populated farmland with virtually no economy. Almost as soon as we arrived I boarded a bus that would take us to our start point. I was a bit resistant at the idea of taking a bus to the start point. That’s like taking the elevator in a gym. I thought the point of this event was to walk, but as the bus wove through steep winding roads, and minutes turned into almost one hour, I realized why we had been driven. When we reached the summit of the mountain the bus finally came to a stop　at 12:05 pm. What Ama-cho lacked in natural beauty, Chibu-mura more than made up for. The view from the top of the mountain　was breathtaking. As soon as I stepped off the bus I felt an intense wind and saw that we were in fact on the highest point on the island. At this elevation, there are no trees, a result of the impact of centuries of steady winds. However, all is green and mossy. It was not so much a mountain, as the climax of several steep hills, rolling down in green lumps to the sea. Beyond the green mounds was a tranquil blue sea blurring into the horizon. I was tired after the 10K walk in Ama, and was uncomfortable with dry sweat sticking to my body, but that biting cold wind and commanding view spurred me on me. The moment I started my journey downhill I was approached by herds of cattle grazing to either side. The stopped eating and stared at me. Their eyes more sad than indifferent. The road was paved in cow dung. This was the only obstacle as there appeared to be no bees or hairy caterpillars like in Ama-cho. Knowing nothing of cow dung before, I learned a fair bit by merely observing it along the trail. First of all, cow dung dries very quickly in the sun. 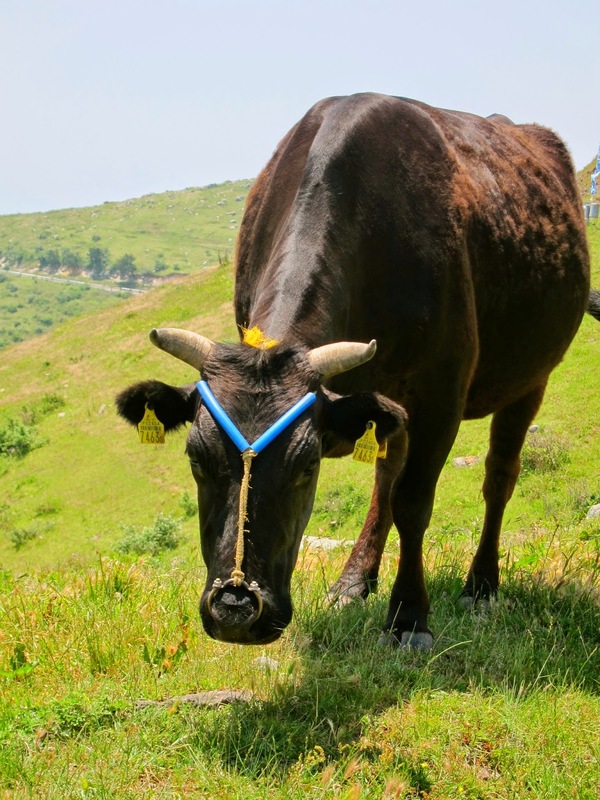 Since cows only eat grass, dry cow dung is basically dry grass, and smells little more than mud. I didn’t feel gross at all by stepping on it, because it didn’t stink and or stick to my shoes. Rather, it softened the asphalt road and made it more comfortable to walk. The cows themselves were much more obstructive than their dung. There were no fences separating them from the roads, (which is why their dung is all over the road), so they could roam freely. Sometimes they stood in the middle of the road and I cautiously walked around them. Halfway down the mountain, I came to a fork in the road. To the left, the course continued on to the finish line. 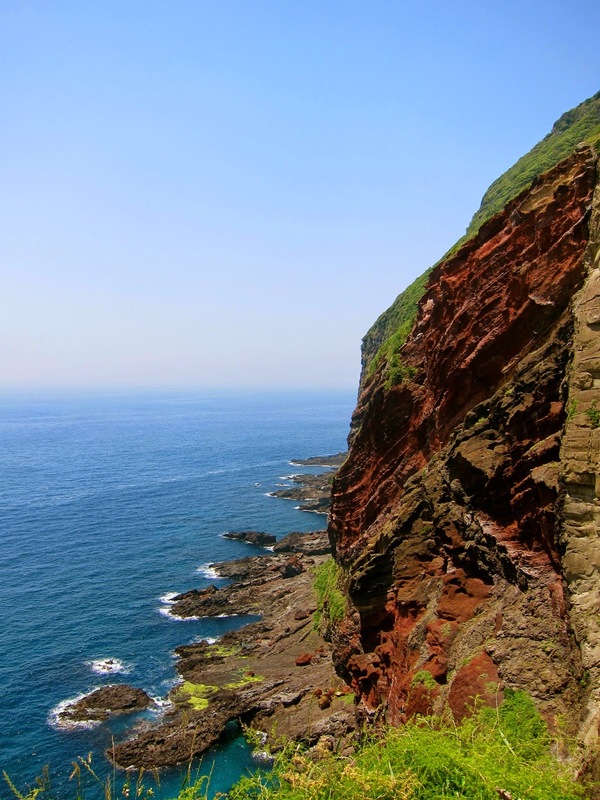 To the right, an optional course left to Sekiheki, which means "Red walls”, a scenic gorge just half a kilometer away. Realizing that I would never be in Chibu-mura again, I decided to take the opportunity to lengthen my walk and check out the gorge. I turned right. Although the distance may have only been 500 meters, all of them were painfully uphill, and it took me nearly 15 minutes to ascend what felt like a really long, steep staircase. Eventually I came to the edge of a cliff, overlooking a massive red gorge. From where I stood, I could see the entire red face of the cliff, down to its rocky shoreline, white waves crashing into its sharp edges. I sat down for a short break while staring at the cliff. Then I headed back downhill and resumed the trail, having added 1K to my course. Feeling a renewed energy, I walked briskly the rest of the way, until I realized that I needed to catch the 3:00 pm ferry back to Ama-cho, and it was 2:45. I still had one kilometer to go. I was too close to give up and take the next ferry at 3:30 (something that would have drastically altered my evening plans), but I was too exhausted to move any faster. Fortunately the last 1K of the race was a downhill spiral slope leading directly to the pier. Gaining the momentum from gravity, I jogged the last 1K and made it onto the ferry with one minute to spare. I was sweating, panting, and smelling terribly, which made for an unbearably long 37 minute ride back to Nakanoshima. My reward for the day’s work was a relaxing dip in the local hot spring, where I had about one hour to bath and change clothes before catching the 4:47 ferry to the island of Nishinoshima.